WhoGo Maps is in minimal maintenance mode. If it no longer works, or if you're interested in new features, please try Pure Maps, a continuation of the same codebase under new maintainership. WhoGo Maps is a full-featured app for maps and navigation with a flexible selection of mostly OpenStreetMap-based maps and related service providers. WhoGo Maps requires the Mapbox GL Native QML component for map display, supporting both vector and raster maps with OpenGL accelerated rendering. 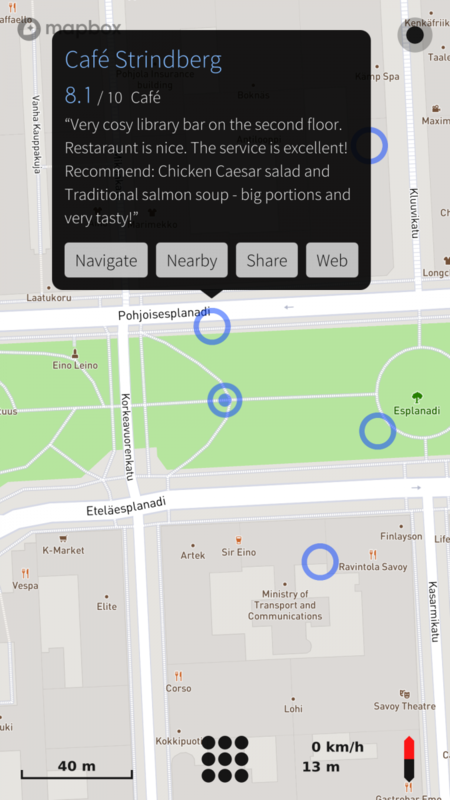 Offline maps, search and routing is possible with OSM Scout Server. WhoGo Maps will list OSM Scout Server among the providers if you have it installed. For it work, you'll also need to have the server running and map data on your device. See the OSM Scout Server documentation for details. Voice navigation requires that you manually install a text-to-speech (TTS) engine – Mimic, Flite, PicoTTS and Espeak are supported. Their quality is about in that order, with Mimic being best and Espeak being worst, but their language and gender coverage varies. Source code and issue tracker are available at GitHub. Translations at Transifex. Discussion at TMO. Why are you trying to run it as root (devel-su)? I have a question: is it possible to start whogo maps by external command with coordinates or address search? If so, we could write a patch for calendar and contacts app to link location with whogo app and open it with corresponding location. Not yet, since I long thought it was not possible, but now is planned. For coordinate arguments it might not be necessary to patch apps though, I'll just make WhoGo Maps a geo-URI handler (mark handling x-maemo-urischeme/geo in the desktop file) and if no other geo-URI handling apps exist, it'll likely work automatically, otherwise you'd just need to set the default mimetype handler. Don't yet know about other arguments like search queries. Wow. That's awesome news. Thanks. Works well and looks good. Thanks for your work. for some reason, whogo maps will not go intor routing. I can give a start and end and a route will be calculated, but it will never display a 'current position', if routing from 'current' psoition search will take forever. Location is on, Device-onl-ode is on. At least that "search taking forever" is some kind of a bug in the code, that shouldn't happen even if GPS isn't working. Command line output would help me. You can try starting as "sailfish-qml harbour-whogo-maps" at the command line, or something like "sailfish-qml harbour-whogo-maps > whogo-maps.log 2>&1" to get the output to a file. (D) onCompledted:334 - Warning: specifying an object instance for initialPage is sub-optimal-prefer to use a component. the command to output a file I was not able to trigger. Could've been a typo. Thanks. I don't see anything useful there though. While PoorMaps is fine with OSM Scout Server, WhogoMaps is apparently unable to trigger the local maps server (selected maps: OSM Scout Day). Indeed, thx. Perhaps this should be more explicit. Also, it requires re-downloading all installed maps. When I try to install Who Go it shows installing but never finishes the installation. Hi! Do you have my repository enabled at OpenRepos? 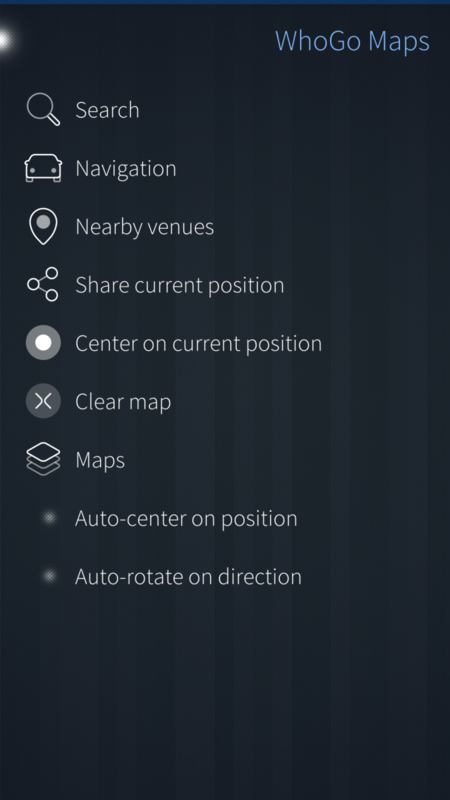 MapboxGL component is available through it and you need it for WhoGo Maps to work. any plans to ever add GPX import? For a cyclist, also for hikers, it's often better to follow self composed routes. It is on the list of things to do, yes, but not really a priority. Translations now at Transifex. I copied them from Poor Maps and assigned the "poor-maps team" there, so if you have translated Poor Maps, you should have access, otherwise click some appropriate button to join. A little issue thingy: when clearing the map while navigating, it doesn't switch back from perspective to normal view. Is there a way to remove/rename those "Unnamed points" created by long tapping onto the map, and save (tapped or searched) points for later reuse? That clear issue is a bug, or an oversight, I'll fix it for the next release. There's no POI management, it's planned, but no ETA. Thanks for this great update/successor to Poor Maps. Great work. 1 rerouting works but it's way to slow, maybe performances on this could be improved? 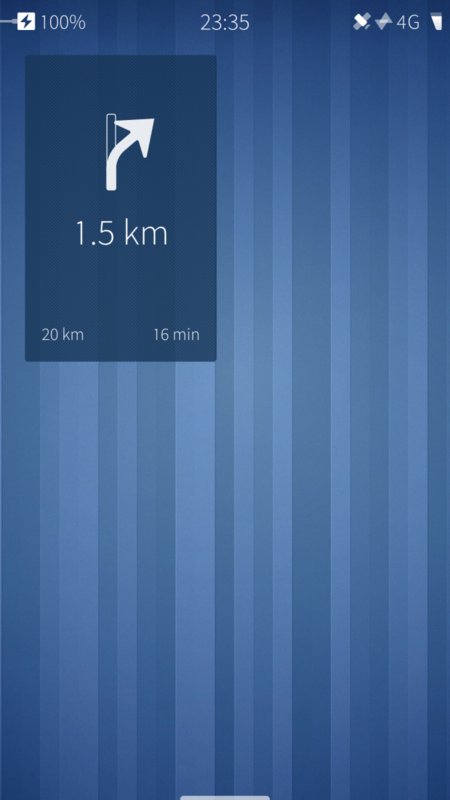 I'm surprised it works on Jolla 1. That's good to hear, but if something is slow it's still likely to be related to that old hardware and not something that's going to be fixed. Another possibility in some cases is slow network and/or service provider. The position icon is subject to change, maybe. It's currently still a PNG icon, but Mapbox GL allows offers better drawing options than QtLocation did, so there's options now. 2 selecting a street is way too precise, for example if i am looking for galileo bulevard in rome and i search for rome, galileo street, here wego returns me all the results for galileo in rome, whogo returns me errors until i input the very exact name, maybe this could be changed? Offering alternative routes is difficult to do well (apart from something discrete like public transport), so that's unlikely to happen anytime soon. And, in particular, if you get bad routes, it probably means the routing algorithm/weights are in some way wrong in your case and alternative routes are just likely to be more wrong. It would help more to have a better router. Search is still lacking autocomplete, it's a known issue, been planned for long, I just haven't had the time to do it. Also, note that in general "street name, city" is better than "city, street name" – some geocoders prefer the order to be from specific to general with a comma between. Would you mind to tell which search engine you were using? If its OSM Scout Server, have you enabled Italian language for address parsing?